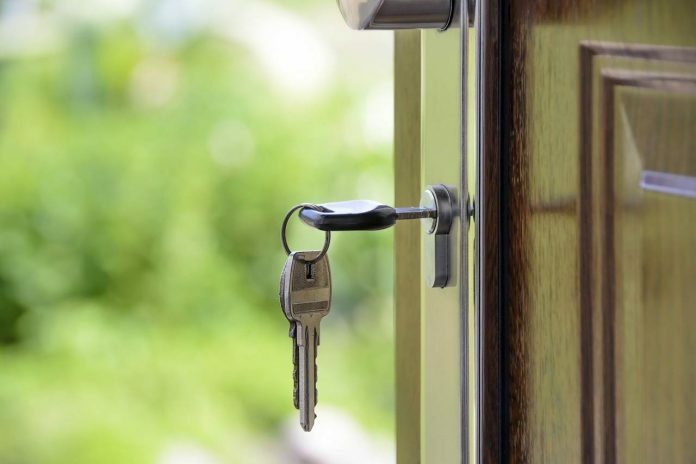 For a long time, it has been debated whether buying your own home is beneficial financially or renting it. Some experts would tell you one thing, while other would tell you another. Yet, this remains a very tough decision which a person must make early in his life. Not only does this decision involve a financial capacity but a strong motivation and great willpower as well. Suppose you’ve set eyes on a property which is worth INR 40 lakhs. Now, if you decide to rent it, it shall cost you around INR 15000 per month. However, when you decide to buy it, you’re required to pay a down payment as well as monthly EMIs. Let’s assume you pay 20% upfront, and you get a loan at 10% p.a. For a 20-year tenure, your EMI would come to Rs 30,881 as calculated via a home loan calculator. You’re almost paying an EMI of a thousand bucks more than the double of the rent you would pay for the same property. That’s some difference, enough to dissuade you from buying your own house. The major disadvantage of buying a home early is that with your smaller starting salary, you’re left with a meager take-home income. This will prevent you from spending a lavish lifestyle. However, have you considered that if you decide to buy the property at a later stage, it may become even more difficult to purchase due to appreciation in the cost? Also, this cost difference between EMI and rent is never going to come down, on the contrary it may increase further up, especially if you’re eyeing a property in cities. At a later age, you might have to settle for a cheaper house, or move to a far-located suburb to be able to afford your kind of dream house. So, does this mean that a person should continue living his entire life in a rented house just to be able to live in a house he likes? Well, no. You can’t do that either. Why do one buy a house? The chief reason for a person to decide to buy a home is psychological. You may convince yourself all you want, but in the end, the monthly rents would come back to haunt you. Who likes that at the first day of the month the landlord knocks at your door asking for a cheque? Or, what if the landlord decides he cannot rent the house to you any longer? Moving to another house is a bigger headache, and doing that frequently…??? The society, in one way or another would keep reminding you that you live in a rented house and that you cannot afford to buy one for yourself. All this mental pressure built upon, eventually forcing you to buy a house impulsively, making a wrong, poorly thought decision. Moreover, where is the sense of security in a rented house? When you own a home, with your own roof above your head you feel much relieved, and nobody is going to come to remind you that you don’t own a house. You must understand that you cannot live off a rented house for all your life. For that reason, buying a house is considered as a great achievement in India. Thus, it is highly recommended to think this through before you decide whether you live in a rented house or purchase your own. Till now, we have understood that economically renting a house seems more feasible, than purchasing one. However, is it for real? We must also consider that while the difference between the cost of property increases with time, so does the rent. Let’s see this with another example. Suppose two friends, Suresh and Ramesh, with a similar age and job profile live in a similar house, each at a market value of 40 lakhs. Suresh has rented the property at Rs 15000, while Ramesh paid 20% upfront and purchases a home loan of 10%. Now, if Suresh and his landlord are in agreement to increase the rent by 8% every year, let’s see what happens in 20 years. 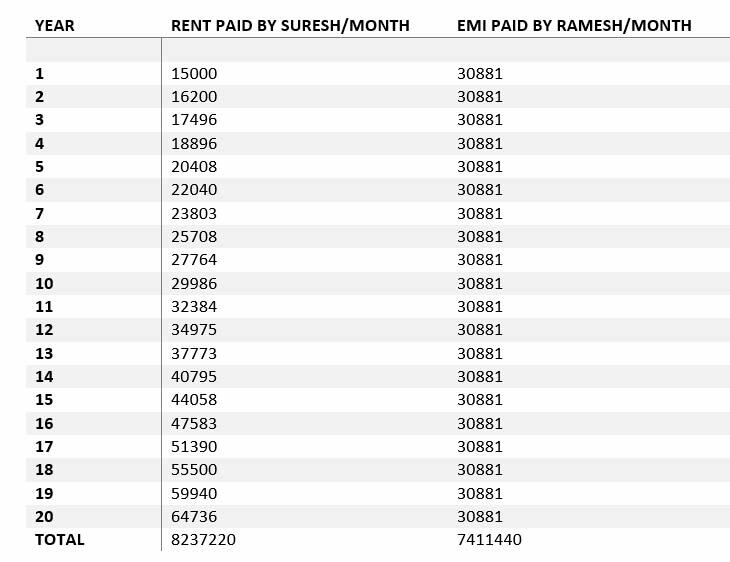 By the 11th year Suresh would begin to pay more in rent as compared to what Ramesh pays in EMI. Interestingly, by the end of this ordeal Suresh would be paying even more than double of what Ramesh ever paid as an EMI. What makes it even more interesting is the final sum of amount both of them have paid in these 20 years. It’s clear, Suresh has paid more money than Ramesh. And, while in 20 years Ramesh would be completely free of the loan (and rent) and would own a house valued in several crores by then, Suresh would still be paying a huge sum in rent while owning nothing. So, I guess I needn’t tell you more. You already know who the clear winner here is. Make sure you have enough money to pay the down payment. Make sure you find a home which is affordable, such that EMI doesn’t overburden you. As a rule, your EMI cost must never be more than 45% of your monthly income. Make sure after paying the EMI, you still save some money for emergency needs. Make sure you make necessary lifestyle changes to accommodate the new expense in the form of EMI. If you don’t already have children, you must keep in mind that in the future you would require funds for them as well. Thus, plan your investments accordingly.